The Biblical account of Deborah (Judg. 4:1-5:31) does not imply that women should hold civil office. First, there is no explicit teaching anywhere in the Bible that establishes the position that women should bear rule in the civil sphere. The example is not of sufficient weight to overthrow the four-fold cord of evidence of the explicit biblical teaching on the headship of man (Gen. 2:7, 2:18-24; 1 Tim. 2:13; 1 Cor. 11:3, 8-9), the clear statements of the law (Exo. 18:21; Deut. 1:13, 17:14-20), the picture of the virtuous woman (Prov. 31:10-31), and the lament over women ruling Israel (Isa. 3:12). As the Westminster Confession of Faith admonishes: “The infallible rule of interpretation of Scripture is the Scripture itself: and therefore, when there is a question about the true and full sense of any Scripture (which is not manifold, but one), it must be searched and known by other places that speak more clearly.” We contend that the biblical teaching presented above speaks far more clearly to the issue of women magistrates than does the account of Deborah. Second, the judges during this period were more military leaders or “avenging deliverers” than they were civil magistrates (cf. Judg. 2:16-19). Deborah is not a “judge” in the same sense as the other judges in the book. The account of Deborah is unique in that she did not lead Israel into battle herself (as did the other judges in the book), but, rather, the Lord choose Barak to be the military commander. Barak was the true “judge” here (cf. Heb. 11:32 where Barak alone is mentioned), and Deborah’s role was that of a “prophetess” who gave divine guidance to Israel. Third, the Song of Deborah and Barak gives some important insight into Deborah’s actual position in Israel (Judg. 5:1-31). In verse 7, she claims to be a “mother” in Israel, not a father. This is significant, given the headship of the father in Israel, and it is in line with our suggestion that her role was one of support and guidance to the leaders of Israel as a prophetess. Additionally, verse 9 indicates that there were yet “governors” (literally, lawgivers, or leaders) in Israel. This would refer to the elders of the people and the rulers of the tribes. This further supports the idea that the judge was not a civil magistrate in the usual sense, but rather a military leader and deliverer. Deborah was neither a “judge” nor a magistrate. Also, in verse 12 of the song, Deborah is exhorted to awake and sing, but Barak is exhorted to arise and “lead,” indicating that Barak is the military leader. Additionally, the “dominion over the mighty” in verse 13 is either a reference to Israel’s victory over Sisera and the Canaanites, or to the gathering of the people to go up to battle; whichever, it does not mean that God has appointed Deborah to the position of civil magistrate. She “judged” Israel (Judg. 4:4) only in the sense that she was sought out by the people for advice and judgment in the settlement of disputes because of her wisdom from God. - William Einwechter, Should Christians Support a Woman for the Office of Civil Magistrate? 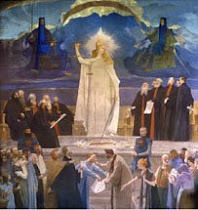 (July 8, 2004), at http://www.visionforumministries.org/issues/ballot_box/should_christians_support_a_wo.aspx.